Packers quarterback Matt Flynn (10) reacts to a touchdown with tight end Andrew Quarless during the fourth quarter of Green Bay's 37-36 win at Dallas on Sunday. It was a tale of two halves for the Packers in nearly every area of the game, and the passing offense was certainly part of that group. In the first half, Matt Flynn completed 10 of 17 passes (two of those completions resulting in negative yardage), threw an interception and was sacked twice. That lack of productivity led to Green Bay scoring just three points in the first two quarters, and it was fortunate to even come away with that when Mason Crosby hit a 57-yard field goal. There was little reason to believe things would get any better in the second half. In the second half, Flynn orchestrated back-to-back-to-back-to-back-to-back (yes, that’s five consecutive) touchdown drives. Flynn looked like the quarterback who earned $10 million guaranteed from Seattle in March 2012 and looked nothing like the quarterback who was released by the Oakland Raiders and Buffalo Bills in the past couple of months. He threw four touchdown passes, did not have an interception and was not sacked at all. Flynn finished the game with a passer rating of 113.1, which is better than Peyton Manning’s season average. Flynn spread the ball around nicely, too. Jarrett Boykin had six catches for 83 yards, though he was the only top receiver who didn’t have a touchdown. Tight end Andrew Quarless had six catches for 66 yards and a touchdown (the exact numbers he had a week earlier), Jordy Nelson had five catches for 61 yards and a touchdown and James Jones had three catches for 49 yards and a touchdown. The running backs got involved too, with Lacy’s four receptions totaling 30 yards and James Starks’ only catch resulting in an 11-yard touchdown. Even playing on a sprained right ankle, Lacy was dominant. Yes, the Cowboys entered this game ranked 28th in the NFL as a run defense, but Lacy exploited every bit of that weakness. He finished with 141 yards on 21 carries (6.7-yard average) and scored the game-winning touchdown. With this performance, Lacy is now over 1,000 yards on the season, making him the first Packers rookie running back since John Brockington in 1971 to reach that mark. Lacy immediately got Green Bay going in the second half, taking the first play of the third quarter 60 yards and bringing the Packers all the way from their own 20-yard line to Dallas’ 20 in a matter of seconds. From there, Green Bay’s rushing offense kept rolling. Ready for another round of âtale of two halves’? In the first half, DeMarco Murray ran the ball 11 times for 109 yards (9.9 average) with one touchdown. The Packers were living up to their billing as the NFL’s 25th-ranked run defense, and Murray was living up to his status as the league’s most efficient running back (Murray’s per-carry average is No. 1 in the NFL). Then, for some reason, the Cowboys seemed to forget about Murray and the running game in the second half. And considering Dallas was winning 26-3 at halftime, its near-refusal to run the ball made even less sense. Murray was handed it just seven times in the final two quarters and gained 25 yards. On the Cowboys’ first drive of the second half, Murray was tackled for a loss by A.J. Hawk, and apparently that scared Dallas off. Inexplicably, from that point on, the Cowboys passed the ball 19 times and ran it just twice. Yes, with a 19-point lead at that time and while racking up 7.4 yards per carry, Dallas almost completely stopped attempting to run. It made no sense whatsoever. Green Bay’s run defense continues to be a significant problem. The Packers allowed more yards even than their season average. With only two games left in the season, it might be a problem that can’t be fixed, but defensive coordinator Dom Capers will have to at least find a way to bandage this area up if Green Bay is going to win its final two games and give itself a chance at making the playoffs. The career turnaround for Mason Crosby continued. Scoring the Packers’ only points in the first half, Crosby drilled a 57-yard field goal right down the middle. After going 2 for 9 last season from beyond 50 yards, Crosby is 5 for 7 this season. So, not only has his overall accuracy improved to a career-best level (88.2 percent), he’s also been consistent on the long-range kicks. Cowboys kicker Dan Bailey was too busy kicking the ball out of the end zone to give Micah Hyde any chances on kick return, which probably isn’t a bad thing for Green Bay considering that the Packers are still the NFL’s worst return team (18.8 yards-per-return average). Hyde had one punt return for 26 yards. Of Tim Masthay’s four punts, one was a touchback and one ended with a fair-catch interference penalty on Davon House. Not a single one of Masthay’s punts resulted in the Cowboys starting with the ball inside their own 20-yard line. Coming back from being down 23 points is not supposed to happen. When it does, one team has to really fall apart and the other has to have just about everything go right. With Dallas’ unwillingness to run the ball on offense and its defense performing horribly in the second half, the Cowboys played their role. Green Bay’s unstoppable offense and its defense stepping up in the second half made sure the Packers played their role, too. After Flynn took a knee three times to run out the clock, Green Bay had tied its franchise record for biggest second-half comeback. The last time the Packers trailed by 23 points at halftime and won was in 1982, when only two current Green Bay players were even alive. 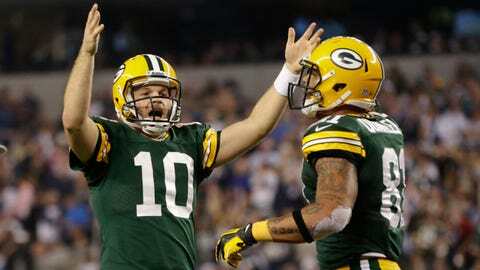 It was a historic game for the Packers and one that kept their playoff hopes alive. This win doesn’t solve all of Green Bay’s issues. Even though the defense performed very well in the second half, the Packers still gave up 36 points. That’s not a point total that often produces a victory. Green Bay’s run defense continues its overwhelming struggles, and the Packers’ offense needs to stop waiting until halftime to get going (they were also down by 11 points at the half a week earlier against Atlanta). Now, Green Bay waits to see if Aaron Rodgers returns this week. But, regardless of whether that happens, the Packers need to win their final two games and watch to see if the Detroit Lions lose one of their final three games (they play Monday night vs. Baltimore). If those two things happen, Green Bay will have defied the odds and made it to the postseason. What the Packers accomplished in Dallas keeps that as a possibility.